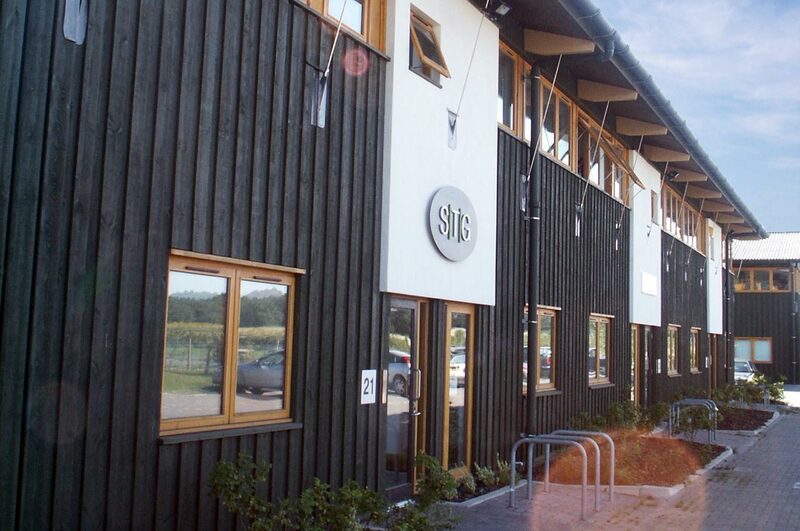 A development of 10 business units on the EcoTech Business Park, constructed using environmentally sustainable building techniques. These include a glue laminated timber frame, high levels of cellulose fibre insulation, timber cladding, timber joinery and fittings and organic paints and stains. Panels of render define the entrances and a continuous strip of windows gives flexibility in positioning of internal partitions. The units are designed to be flexible and allow for easy sub-division accommodating both small and medium size businesses. Heat is provided by a district system that is connected to the local EcoTech centre. A generous eaves overhang which expresses the structural frame provides solar shading to the first floor offices. The layout of the units is unusual in that they are dual aspect with the main entrance and visitor parking at the front and vehicle access and goods deliveries to the rear. This increases the flexibility of the units by allowing office and warehouse/light industrial functions to operate separately within the same building.